Only use this if you do trust your skills. Disabling script tags blocking is something that you can do. 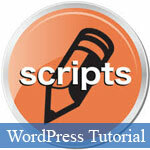 You will need to modify the wp-config.php file in order to enable the tags. You just have to define Custom_Tags as being TRUE. Then you want to make the necessary modifications for the functions.php page and you are done. In some situations you will want to load the script sitewide while in other cases you just want to focus on a post or a page. You can easily test various different plugins that offer the features you are looking for but the one that is by far the most comprehensive is Scripts n Styles. You would use this WordPress plugin in order to add the scripts you desire at a truly global level, for the entire site, or you can simply add at a post or page level.